The Prophet Muhammad set a benchmark for treating others with respect and dignity, an attitude Muslims have aspired towards throughout the ages. His relationship with Jews was based on strong ethical principles, a community he looked to as natural allies with shared theological roots. The Prophet's Mosque in Medina. "All of humanity is the family of God’, Muhammad declared, “and the most beloved to God is the one who is of most benefit to His children.” Muhammad taught his companions to treat everyone, regardless of belief and background, with respect and tolerance. A neighbour, he asserted, has rights over you, and, by extension, an entire community whatever their religion. 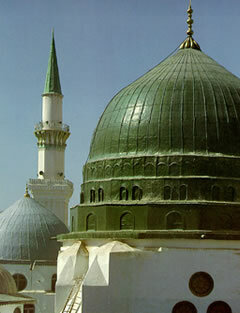 In Medina, many of Muhammad’s neighbours were Jewish. He would regularly visit them, give charity to those who were needy and exchange gifts with them. 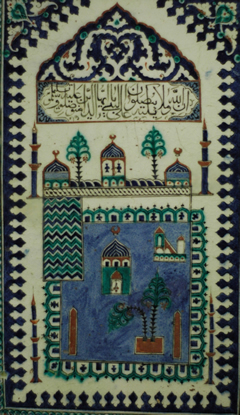 Panel representing the mosque of Medina. 18th century. Found in İznik (Turkey). (Collection of Albert Sorlin-Dorigny; purchase, 1895). One of Muhammad’s first acts after his emigration to Medina was to establish an agreement with the Jews which would ensure them full protection, respect their beliefs and give them equal rights. This constitution, known as the Charter of Medina written in 622, is considered to be the first written constitution, existing almost six centuries before the Magna Carta – the English feudal bill of rights, and preceding the American Constitution of 1787 by well over a thousand years. The Charter of Medina was binding on the Muslims and affirmed that the Medinan Jews had ‘support and the same equal rights as any one of us’. In return, the Jews pledged to fight alongside the Muslims if the city came under attack. Amongst those Muhammad pledged to protect were the Jewish farmers who worked in the Fadak oasis. These farmers were attacked many times by one of the Bedouin tribes, and even killed all thirty men that Muhammad had sent on an expedition to the oasis. So Muhammad took stronger measures, sending two hundred Muslims to defend the Jewish farmers. They were victorious, and the Fadak oasis once more saw peace. Muhammad exchanged gifts with Jewish neighbours. Muhammad’s daughter Fatima worked for a Jewish man – she spun wool in return for grain. When Muhammad died, his shield was mortgaged with a Jew. Muhammad's wife Sofia was a Jewish woman and considered a ‘mother of the believers'. Check out our other campaign 'Inspired by Muhammad'. 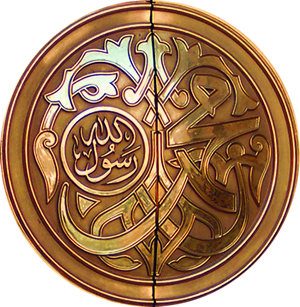 Muhammad repeatedly instructed his companions to respect the people of the Book – the Jews and the Christians, as commanded in the Quran. Under his rule in Medina, the Jews enjoyed religious freedom and lived according to their own Jewish legal system. One day, Muhammad was with some Muslims when a funeral procession passed them by. Muhammad stood up out of respect. His companions were surprised and informed him that it was a funeral of a Jew. He replied, “Was this not a human soul?’ demonstrating his solidarity and sorrow for this loss to the Jewish family. Muhammad’s respect for others also afforded him admirers from the Jewish people. One young Jewish boy who served him, grew to love Muhammad, and often followed Muhammad wherever he went, delighting to be in his company. Muhammad never once asked him to give up his faith. The Ottoman Sultan Bayezid II dispatched the Ottoman navy to recue Jews from the Spanish Inquisition. He issued an edict encouraging Jews to seek shelter and a new life under his rule in Turkey, and ordered his governors to make their entry across Ottoman borders an easy one. Learn how anti-Semitism goes against Islamic principles.